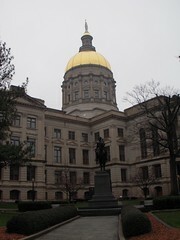 So naturally at the top of my Atlanta to do list was to tour the Georgia state capitol – an impressive looking gold domed building located in the city center. Unfortunately the only impressive thing about it is the exterior. From the second we stepped through the doors, everything went downhill rapidly. 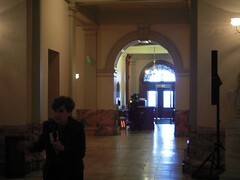 My first objection is simple: I had to show identification to get in. Seriously—what purpose does showing my drivers license serve? The “security” “guard” behind the counter barely looked at it, didn’t cross check it against any list, or other wise seem to do anything other than mentally check it off her list that it had been seen. We then had to go through a metal detector – I can understand and sympathize with that. The state allows concealed weapons so I’m willing to bet that more than one lobbyist, legislator, or other member of the public has forgotten about the gun in their briefcase and nearly brought it into the building. All this means that showing my drivers license did nothing to enhance security—it is just some bizarre step undertaken to make people feel safe without actually making it safer. Once we’d cleared security we asked about the next free tour (scheduled to start at 11 o’clock) and were directed into the rotunda where there was a class listening to a tour guide talk about the history of Georgia. It was a few minutes before 11 and it seemed a bit implausible that this was the pubic tour—but we verified that it was and followed this group of 30ish elementary school kids. I can tell you two things that I learned from the tour: First the state capitol of Georgia has moved several times. I think Atlanta is its fourth or fifth location, but I’m not certain. Secondly, there is a statue of liberty on the top of the dome, but it doesn’t carry a book, like the one New York City, it carries a sword, which is pointed down, which means it is peaceful. The guided tour took us from the rotunda on the second floor, up two sets of stairs to the fourth floor, and then the docent wandered off—not having imparted any knowledge whatsoever. An older woman who was also in the tour was furious and left to complain to her state representative. We just wandered around the fourth floor looking at various display cases. Apparently the people wanted a state capitol that looked like the US Capitol in DC, and from the exterior that’s what they got. In the interior they got a dumpy facility that makes an effort to be impressive but ultimately needs a lot of renovation—starting with a paint job. Probably the people of Georgia are too cheap to maintain their capitol. We were not in the building all that long when we decided to leave—making our way back down—when we passed the governor’s office and I noticed a portrait of President Ronald Reagan in front of some USSR symbols. This aroused my curiosity, and I kind of wish I hadn’t stopped to ask—because what I chiefly learned is that the women at the information desk in the state capitol are not well informed. “Reagan’s portrait is there because he was president when the wall fell,” the woman answered. She didn’t seem to believe me, although she added that the portrait of Reagan was painted by an artist from Georgia-which justified why it was hung, even if Reagan wasn’t president when the wall fell. That has to be one of the funniest, yet typical, interviews I’ve read. You really expected her to know the answer just because she works at the information booth? At least they still us theirs. The official capitol building in North Carolina is a drab, horrible looking regular office building in downtown Raleigh. Clearly, the dis-information booth attendant did NOT have the advantage of having attended INDIANA UNIVERSITY. That’s obvious! 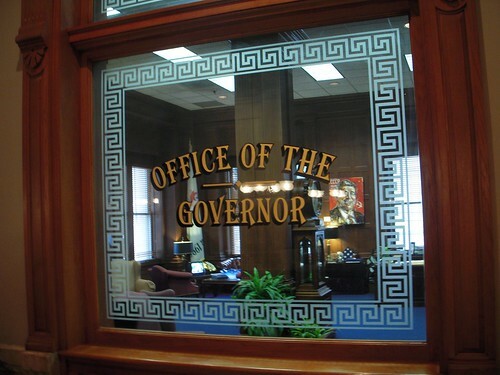 By the way, for some odd reason, the Governor’s office window reminds me of an old-fashioned barber shop window.